Optimism is the true Resistance. Support Alethea’s Videos and Writing! Alethea can continue making and sharing magic thanks to patrons like you! 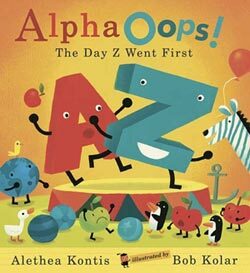 I am sad to report that after eight happy years, Candlewick is finally putting ALPHAOOPS: THE DAY Z WENT FIRST out of print in hardcover. There are only about 50 left in existence — if you’ve ever wanted one–for you or as a gift for a friend — now’s the time to pick one up. You guys get whatever you want, and then I’ll buy the rest. This entry was written by Princess Alethea and posted on April 13, 2014 at 10:21 am and filed under Books, writing. Bookmark the permalink. Follow any comments here with the RSS feed for this post. *hugs* I gave this book and H is for Halloween to a friend’s twin granddaughters. It is their favorite “Letter book” EVERY and they read them all the time. The truely great books are never forgotten by the children who love them! Oh no! Your Alphaoops books are my son’s favorites, and mine too! So, there is no way the Christmas book is happening? We were looking forward to it! I’m trying to get in touch with the illustrator to see if there’s a way we can do it on our own…but as of right now, I’m sorry to say no Christmas book is forthcoming. I would love to do it too! Have an email in to the illustrator, but haven’t heard anything back. It feels like making this whole project happen is a LOT tougher than it should be. But I won’t give up!! Oh no! We just discovered your books in our local library and we LOVE them!!! My daughter caught from the end of the Halloween book that a Christmas book would be coming….. She will be very disappointed!!! We enjoyed alpha oops and the Halloween one so much, I hope you continue writing children’s books. You have a gift!